MySpace and Citysearch are jointly announcing a new MySpace property this morning called MySpace Local. The site combines Citysearch business listings (including address, photos, menus, videos, maps and hours of location) from a thousand cities with the MySpace community. The site is launching into private beta this week, with a general U.S. launch next month. The new site will eventually include listing information for all Citysearch businesses via small business listing pages. To start just restaurants, bars and “nightlife” listings are included. 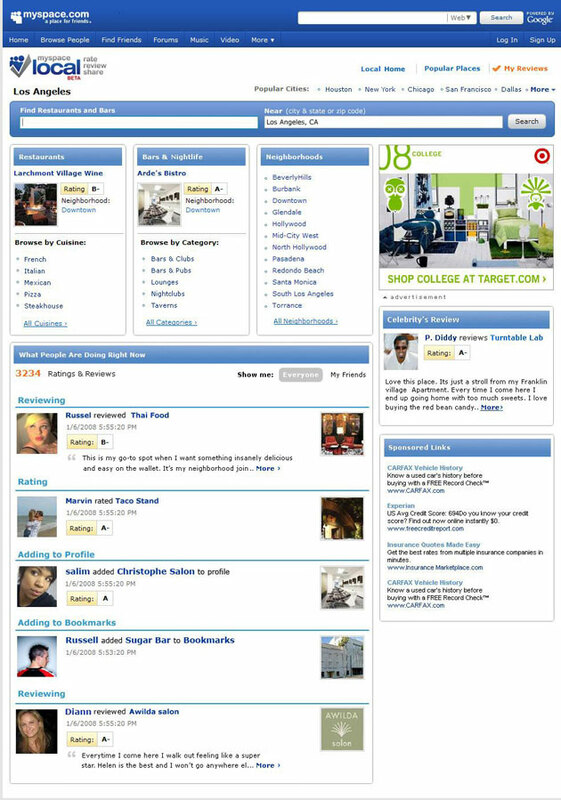 Users can rate and review businesses, which is shared via the MySpace activity feed. Don’t just skip over that last sentence. This is good stuff – users will be able to see the restaurants, bars and other businesses that their friends are interested in, and how they rated those businesses. When you first visit MySpace Local, the first thing you see are reviews from friends. Listings are grouped into city hubs for all major U.S. cities and include new local search functionality. And eventually, MySpace says, users will be able to make reservations and upload their own photos and videos. Features will also be built into MySpace mobile products. A demo of the product is here. Don’t be fooled – the reason for all this local content is to create premium ad space. Businesses will be able to use MySpace’s self service MyAds product to promote these pages. And more importantly, they can place an ad when someone is looking at the competitors or other local businesses. Expect national brands to advertise as well – Coors and Outback Steakhouse are initial sponsors of the site. Citysearch has already integrated Facebook Connect, allowing Facebook users to pull reviews and other information they leave at Citysearch into their Facebook news feed. MySpace is saying we can expect an implementation of MySpaceID, their version of Facebook Connect, in the near future. But MySpace Local goes a full step further, bringing all this listing data directly into MySpace itself, and creating literally tons of ad inventory for the sales team (and self service product) to sell into. The terms of the deal aren’t being disclosed, other than that this is a revenue sharing agreement.